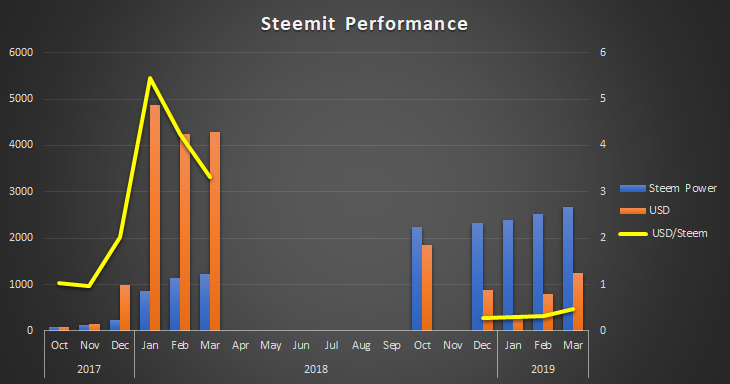 This is my monthly update report to check myself to see how I'm doing on Steemit and something that people new or looking into Steemit can use to kind of give them an idea on what kind of earnings an "average" person gets on the platform. You read my February Report at this link and my January / 2018 Full Year Report at this link if you want to see how I've progressed through the year so far. I haven't been writing on my blog as much as I've hoped and want to make that for a goal this month. The articles I write on there usually are a little more time consuming and I try to make them "higher quality", at least in my eyes, so those type of articles aren't something I can do every day. Since the beginning of the year I've been earning about 100 SP a month. The total value of my account went up by about $160 or by about $5 a day thanks to the slowly rising price of Steem. I was much more active this month making about 800 comments and posts vs 600 the first 2 months of the year. Honestly, I'm a little disappointed that my Steem Power hasn't increased more with the additional effort I've been putting in, but have to admit I'm my own worst enemy putting some Steem Dollars in Savings for the upcoming Steem Silver Round and been buying up Steem Monster packs and some Steem-Engine tokens when I get a chance. Speaking of Steem Silver Round 2019 I'd really like to see @welshstacker combine his design with @dfinney's design and come up with a combination of these two coins. I really like welshstacker's coin, but think he needs a phoenix in the middle of his flame and really like the phoenix and the saying around dfinney's design. 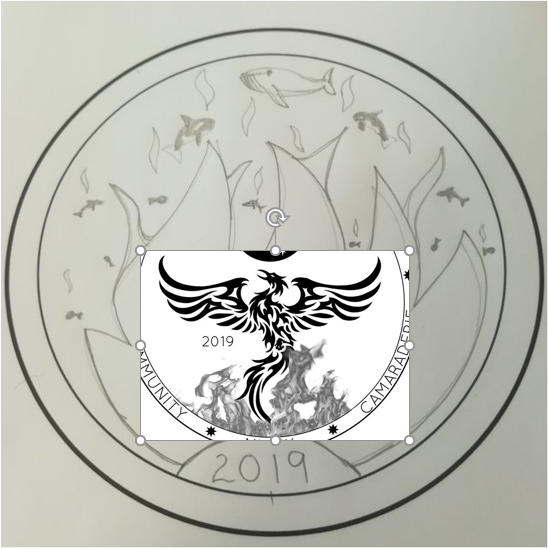 Maybe no one agrees with me on this and I'm crazy, but I like the theme of the phoenix this year, but would like to see the winning design incorporate the minnow, orcha, whales into the round as that's been tradition for these coins for the past 2 years and a great theme to keep on a Steem Silver Round. I would like to thank @arcange for taking over the SteemWhales website and continuing to running it on the SteemitBoard Website so I can track and "gamify" my Steem progress. Another great month, though I wasn't able to make some of my goals like at least 1 post per day. I already missed April 1st so won't be able to hit it this month either, but maybe I can update it to average 1 post a month. I finally made it to 2000 followers and to 2,700 SteemPower. My goal for next month will be to make it to 2,850 SteemPower so that I can have at least 500 undelegated SteemPower. This month I've made some small delegations using DLease that I plan on writing about on a future update as a nice way to earn some passive income. I'm still plugging along on Magic-Dice and tried for a couple of weeks to "mine" some Magic Tokens. I'm up to 1 Steem earned from my 100 SP delegation, but I'm still down 3.5 Steem from the gambling that I've done. I'm not going to gamble any more this month as it's not worth my time and it seems to be just prolonging the point at which I'm going to break even so will just sit back and passively earn Magic Tokens using my delegation. @OCD has started back up curating again so that will take up some more of my Steem time as well as trying to continue to complete my @steemmonsters dailies as much as I can and competing in tournaments when I have time. It's nice to be curating again with OCD and finding new authors that deserve a spotlight shined on them and be able to use @ocdb to continue to grow on the platform. If you've made it all the way to the end let me know in the comments down blow by giving me a thumbs up. If you have any comments or questions let me know in the comments down below. Hoping these type posts continue to help new people on the platform somehow and encourage them with quality, consistency, life on Steem starts to pay off.